Arriving this week on Collector’s Edition Blu-ray is 1994’s “Double Dragon”, the film adaptation of the popular video game. This film came out the year after “Super Mario Bros” and the year before “Mortal Kombat”. As far as quality goes, I would say it is right there in the middle of the films it was sandwiched between. Unlike, “Super Mario Bros”, at least “Double Dragon” made some sort of sense. That is about the highest praise I can give this thing. One thing I have always dug about the “Double Dragon” film, was the setting of New Angeles (a crippled and decayed future Los Angeles). Very similar to that of “Escape from L.A.” though the ladder was done a bit better. The biggest letdown with the film is not the cast (which was adequate at best), but the fight choreography. The fighting is so dull and uninspired, specially from co-star Scott Wolf. When you have a film based on a video game that is all fighting, how do you mess that up? At least “Mortal Kombat” knew what it was supposed to be. 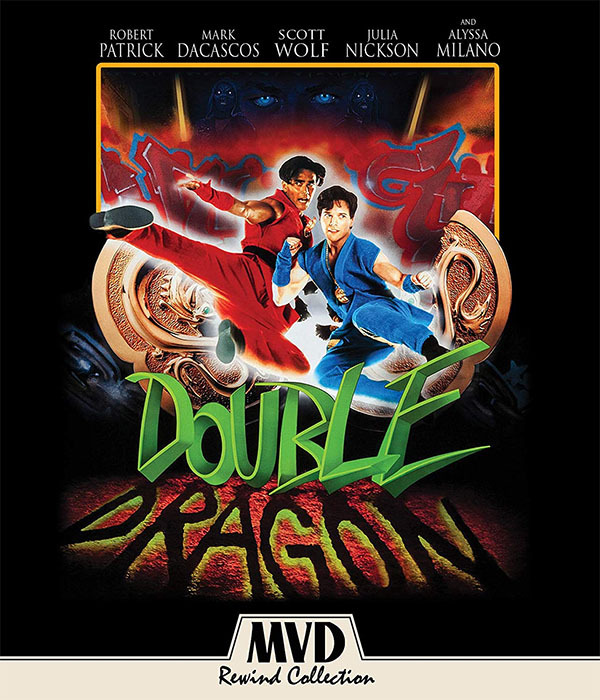 Now, if you are a fan of “Double Dragon”, MVD Rewind has delivered a release for you. Aside from the Blu-ray and DVD, there is a collectable mini-poster, and a new full-length documentary on the making of the film. The 1993 animated series pilot is also included. Though I can’t recommend the film, I can recommend this release for those who love it.